I started thinking about my retail career when I had my first few real experiences in internships. After graduating Bentley, I started with Ann Inc as a Digital Marketing Intern. My previous digital marketing internships helped me get this role. After successfully completing the 3 month program, I was hired on as a freelance Assistant Site Merchandiser for Ann Taylor. During this time our company was acquired by Ascena Retail Group. Toward the end of 2017, a full-time position became available at LOFT, our sister brand, and I began working with the LOFT team by February 2018! I became interested in retail from a young age. I have always been interested in clothes and shopping! I didn’t know what “Site Merchandising” was until I was exposed to it during my time as an intern & freelance assistant. It is a niche in the fashion world that my transferable skills fit nicely with. I find the most rewarding aspect of my position is all the different people I cross paths with. I enjoy working cross functionally with so many teams, and I get to work with a lot of awesome people. I find the most challenging aspect of my position is the extreme versatility required to be successful. In the world of fast fashion, we need to be extremely adaptable and flexible to changes which can be very challenging. The most helpful advice I have for someone preparing for this career is to take advantage of any and all opportunities presented to you. This industry is made up of a tight knit community and is challenging to get into. Internships & freelance positions are a great place to start because you get to try so many different things. The Bentley specific resources I would recommend to someone pursuing this career are to the excellent courses Bentley offers. I would recommend any retail/merchandising courses, but especially to focus on IT 101 because most projects are in Excel! The person that was most helpful in getting me where I am today was not just one person, but a department. Career Services (Amanda, Colleen, & Kristine)! I was a Career Colleague at Career Services. I learned how write a cover letter and perfect a resume. I was able to get some influential internships and was not afraid of accepting an internship post grad. I think there is a stigma about not getting a full time associate role immediately upon graduation, but there are soooo many other opportunities! 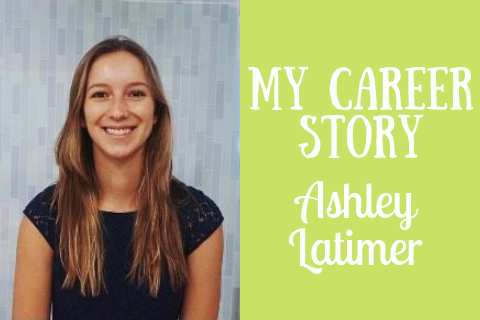 Be sure to connect with Ashley on LinkedIn if you want to learn more from her about retail, LOFT, or more!